OK, so we all know that the F-18 was the plane designed to replace the F-4, A-7 and A-6 as a fleet defense fighter and both light and medium attack. We also know that it was not able to meet all original specifications, something that has become common with new design US aircraft. We also know that the Navy had it pretty much forced down their throat to keep Northrop and McDonnell/Douglas employed. We also know that the final F-18 design differed so much from the losing YF-17 design in the YF-16/YF-17 flyoff, that it was pretty much a brand new plane that only generally looked like the YF-17. The F/A-18C is the single-seat variant and the F/A-18D is the two seat variant. The D model can be configured for training or as an all-weather strike craft. The "missionized" D's rear seat is configured for a Weapons and Sensors Officer to assist in operating the weapons systems. The D model is primarily operated by the U.S. Marine Corps in the night attack and FAC(A) (Forward Air Controller (Airborne)) roles. The F/A-18C and D models are the result of a block upgrade in 1987 incorporating upgraded radar, avionics, and the capacity to carry new missiles such as the AIM-120 AMRAAM air-to-air missile and AGM-65 Maverick and AGM-84 Harpoon air-to-surface missiles. Other upgrades include the Martin-Baker NACES (Navy Aircrew Common Ejection Seat), and a self-protection jammer. A synthetic aperture ground mapping radar enables the pilot to locate targets in poor visibility conditions. C and D models delivered since 1989 also include an improved night attack capability, consisting of the Hughes AN/AAR-50 thermal navigation pod, the Loral AN/AAS-38 NITE Hawk FLIR (forward looking infrared array) targeting pod, night vision goggles, and two full-color (previously monochrome) MFDs and a color moving map. In addition, 60 D model Hornets are configured as the night attack F/A-18D (RC) with ability for reconnaissance.These could be outfitted with the ATARS electro-optical sensor package that includes a sensor pod and equipment mounted in the place of the M61 cannon. 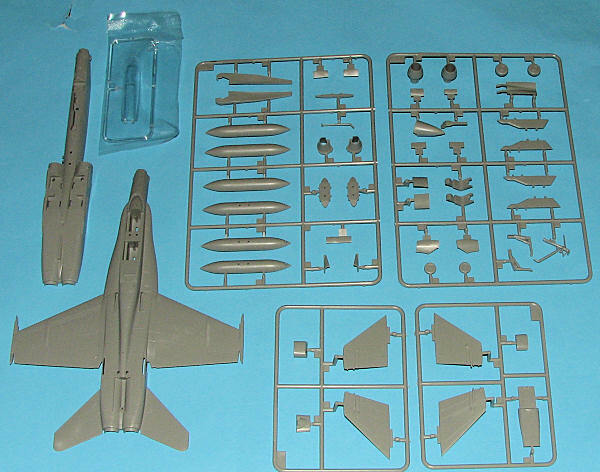 Many of you know Hobby Boss from their easy to build 1/72, under $10 aircraft kits. These kits are generally no more than a few pieces with most of the fuselage already together to some degree. 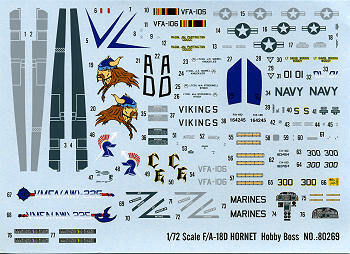 Hobby boss also does larger 1/48 kits that are just as good as other standard kits. Recently, they have ventured out into doing larger jets and so the price has increased commensurate with that. This is one of them. The kit is still somewhat simplified as the upper fuselage, wings and horizontal stablilzers are one piece and the lower fuselage is the other. There are large attachment tabs for the landing gear doors and the fuselage alignment pins and holes are also quite large. Hobby Boss has added some 'lips' to a few sections to help in getting things properly aligned. The detail level is good for these kits, though if one really looks, the detailing isn't as intensive nor is it as petite as one will find on the much older Hasegawa kit. Before going much farther, this is not a copy of the Hasegawa kit, though there are similarities (like no weapons and decals for instrument detail). Other things different are no boarding ladder or even the engraved panel line for it. The cockpit tub is abbreviated with a straight rod for the control sticks molded in place. The seats are somewhat generic as well with the basic shape of an SJU-17, but then it could be used as an ACES seat as well. Intakes are well molded with a conical intake that needs a backing plate added to prevent seeing into the fuselage. The speedbrake is molded in the open position, a very unusual sight on the ground. One can cut the attachment points to glue it in a more normal mode. Though there are no weapons, that are a centerline and two wing racks. These have fuel tanks for the centerline and outboard wing racks with a bomb rack for the inner ones. Break out the Hasegawa weapons set if you want anything on them. For some reason, you get F-18B and F-18D fins, but you'll want to use the ones listed in the instructions. The kit also has but one canopy and that is a single piece unit that cannot be posed open. Instructions are basically four diagrams to show where the bits go, each diagram with a few more bits on it than the one before. Color information is Gunze reference with generic names on the nicely done full color painting and markings guide. I believe the greys are FS 36320 upper and 36375 underside, not the highly contrasted shades shown. The decals are superbly printed and while others have commented on difficulty with them, I've not experienced that. Markings are for two planes. One is the box art plane for VFA-106 and fortunately the insignia on the sheet are not as distorted as those shown on the box or drawing. The other is the boss plane for VMFA-225. There are also a number of very nicely done aftermarket sheets that have F-18D options on them. Two things should be in your mind at this point. One, is this new kit the best in the market? Well, I'd have to say no. 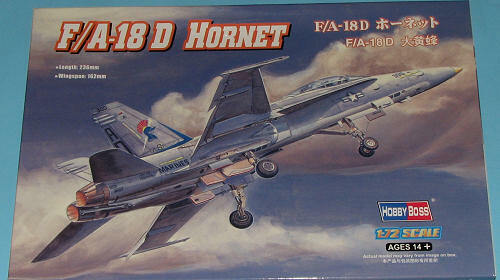 Though I've not seen the Academy F-18D (assuming one is available), then I'd put my loot on the Hasegawa kit. It is, to my mind, better detailed and has a full cockpit that doesn't stop at the instrument panel. Of course, it is a much older mold so probably needs a bit of cleanup of its parts and the Hasegawa F-18D can be quite difficult to find, selling out rather quickly when released. There is also the upcoming price increase from Hasegawa that may not make it quite as desirable. However, if one is not going to do the contest scene, then this kit has several things in its favor. One is that it is less complex. Secondly, it has big, beefy tabs for the gear doors and large attachment points for the other parts that I find quite appealing and make for a sturdy construct. Price-wise, it is probably reasonable for a kit of this size in today's market. One thing for sure, it will look like what it is supposed to be and I'm sure you will find it to be an appealing build. Thanks to 'store credit' for this one.